OPTrust has a variety of material available to address some of the more common events that may affect a member or retiree. Our print publications can also be obtained by contacting us. Where there is detailed information on a topic, we refer you to one of our pension booklets that provide additional information. Fact Sheets contain in-depth information on select topics. All fact sheets are available to you by clicking View all fact sheets. OPTions is a newsletter for members of the OPSEU Pension Trust. Its goal is to provide useful and timely information about the OPSEU Pension Plan. Pension Connection is a newsletter for pensioners of the OPSEU Pension Trust. Its goal is to provide useful and timely information about the OPSEU Pension Plan. OPTrust produces an electronic news bulletin for employers to advise them of changes in OPTrust's administrative policies or procedures. Our Funded Status Report provides detailed information on OPTrust’s strategy and results in the areas of pension funding, investment management, plan administration and member service, together with information on the Board of Trustees, plan governance and our audited financial statements. The Plan Text defines the specific legal provisions of the OPSEU Pension Plan. Pursuant to a Sponsorship Agreement dated April 18, 1994, the Crown in right of Ontario and the Ontario Public Service Employees Union agreed to establish a separate pension plan for members of the public service pension plan who are members of OPSEU and certain other designated bargaining units. 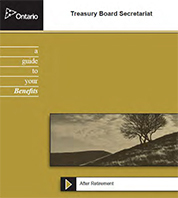 The purpose of this guide is to provide you with a summary of the benefits that are currently available to you as a retiree of the Ontario Public Service (OPS).